In the very beginning, the bite of the Black Widow Spider causes no pain at all. Then it feels as if damaged by a small pin. 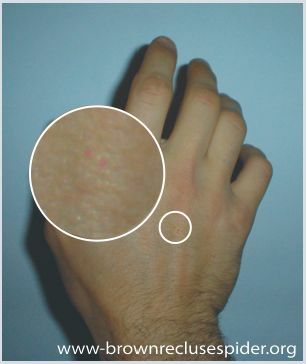 As the picture below shows, two tiny red spots can be generally seen at the core of the swollen area. Soon, the venom spreads and the injury grows in size, redness, and dead tissue. The victim must necessarily attend an emergency room in day number one. Furthermore, succeeding in trapping the spider to show it to the doctor could be helpful in order to prescribe the correct medication.